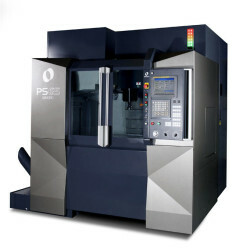 CNC machining centers and the precision work they do in plastic injection mold making process truly make them the workhorse of the modern shop. It really wasn’t that long ago that there were no CNC milling machines– everything was done on manual machines, such as a Bridgeport. Can you imagine returning to those days? When I was an apprentice, in 1978, CNC mills were just entering the shop. Now, they do the bulk of the work in any modern machine shop. I, for one, do not miss the tedious, complicated setups required to do compound angles, conical radii and adding draft to all the core features. What was once very time-consuming is now an everyday humdrum event, thanks to CNC machining centers. Nostalgia might be nice on a moonlit night, but do you really want to return to the “good old days”? Mold base work. The insert pockets, the core and cavity pockets, interlock pockets, slide openings, many water-lines, in fact, just about everything you find in a mold base. Roughing and semi-finishing of cores and cavity blocks. Now, with hard-milling a common operation, many cores and cavities are finished in the VMC. As much of the detail as possible is milled because it is so much faster than EDM or grinding. Electrodes are made in the VMC. Both copper and graphite electrodes are made here. Once the program is made, you can make as many duplicates as you want, even for replacement parts far in the future. 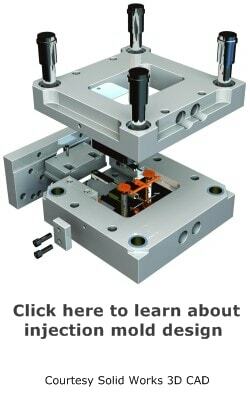 All kinds of inserts, slide components, lifter details, and other features used in injection molds. In a nutshell, most shops use the CNC milling center as their workhorse and mill as much as possible. It is dependable, accurate, and very fast. A close cousin to the VMC is the CNC lathe or turning center. It is absolutely amazing to watch. What used to take “forever” to make can be done extremely fast and accurate. Another close relative is the 5 axis milling machine. These are highly sophisticated machines that are becoming increasingly common. They are very versatile and able to machine 5 sides of a workpiece in one setup, plus the infinite number of angles sometimes required. Prototypes are commonly made using a variety of CNC machines, as well as SLA and 3D printing. Machining before CNC milling went very slowly. Operations that are now taken for granted were once very complicated to do on a manual machine. Personally, I used to become quite annoyed by the fact that a setup on a manual machine could take an hour, and the actual cutting only a minute or two! It just didn’t seem fair! Many, many errors have just disappeared because of the positioning accuracy of these versatile machines. The global economy has produced quite a variety of quality machining centers with Japan and Europe leading the way. What is the best CNC mill for moldmaking? That depends on your needs and your budget! You can get a very basic knee-type CNC milling machine quite reasonably. Many shops begin with such a small investment and build up from there. This is also a good way to gain experience, if that is lacking. These rather simple machines are actually capable of an amazing amount of work. From there you can invest in a CNC bed type milling machine. These are much heavier, more rigid, and have a much greater capacity. They are more precise and come with automatic tool-changers to keep things running 24/7, if that is what you want. 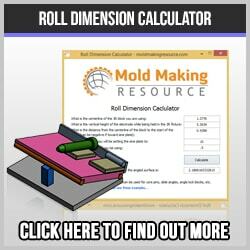 Many companies have worked with mold makers to design VMC’s especially for moldmaking. Often shops are able to use the same machine for steel, aluminum, graphite, copper and even hard-milling. With proper use and care a good VMC will give the owner many years of faithful service. The CNC milling of precision molds truly is at the heart of any modern mold makers operation. 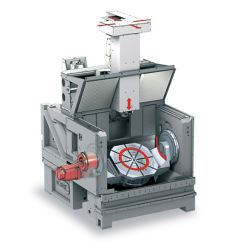 Choosing the right CNC tooling also has a dramatic influence on the productivity of your CNC mills.